Take a look at Popeye and his spinach. He would down a can and practically lift a car. Impressive wasn’t it? Maybe the general idea isn’t so far fetched. Broccoli is a great source of fiber, both soluble and insoluble. It not only meets both types of fiber needs, but it’s also a rich source to add to your diet. 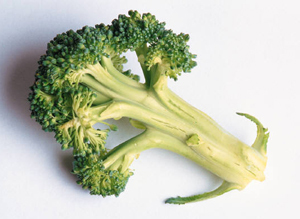 Research has shown indole-3-carbinol – found in the phytonutrients of broccoli – actually deactivates a metabolite which can become cancerous. Broccoli also helps restore sun-damaged skin, reduces the risk of heart disease, and boosts the immune system. At the same time, it also promotes healthy bone growth due to its massive amounts of calcium. The folic acid found in kale is a great addition to your diet if you suffer from poor hair, skin and nails. In addition, the potassium helps to promote the breakdown of lactic acid in muscles after a workout, and is a great food to help prevent muscle soreness in the recovery process. Vitamin K helps promote healthy eye and brain function. The next time you have to spend hours staring at a computer screen or studying for that big exam, try some Swiss chard and let your mind be at ease knowing your brain is getting the nutrients it needs. Spinach is loaded with important vitamins and minerals to promote healthy brain function as well as strong bones and muscles. Next time you have a salad, try it with spinach instead of lettuce for a little variety and a big explosion of taste. Lettuce is great for diets since it’s very low in calories. Magnesium, found in romaine lettuce, does wonders in revitalizing muscular tissues, the brain and the nerves. The chlorophyll-packed juice in lettuce is very helpful in maintaining normal hair color. Lettuce is high in iron, which helps the formation of red blood cells. Lettuce may help in treating insomnia, acid indigestion, colitis, constipation, gout, stress and many other diseases as well.